(1) The names of acyclic compounds are obtained by adding the prefix cyclo to the name of the corresponding straight chain hydrocarbons. 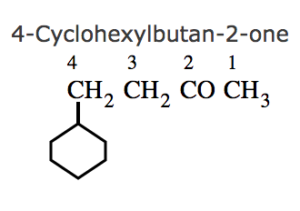 (2) If two or more alkyl group or other substituent groups are present in the ring , their positions are indicated by arabic numerals 1,2,3,4 ….while numbering the carbon atoms of the rings , the substituent which comes first in the alphabetical order is given the lowest locant provided it does not violate the lowest set of locant rule. (3) If the ring contains more or equal number of carbon atoms than the alkyl group attached to it , it is named as a derivative of cycloalkane and the alkyl group is treated as a substituent group , otherwise it is named as a derivative of alkane and the cycloalkyl group is considered as a substituent group. (4) If the side chain contains a multiple bond or a functional group , the alicyclic ring is treated as the substituent irrespective of the size of the ring. (5) If more than one acyclic ring is attached to a side chain, the compound is named as a derivative of alkane irrespective of the number of carbon atoms in the ring or the chain. 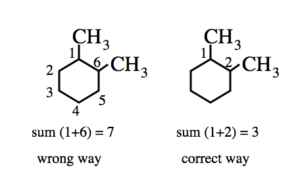 (6) If a multiple bond and some other substituent are present in the ring , the numbering is done in such a way that a carbon atoms of the multiple bond gets lowest locants 1 and 2 and the substituent groups gets lower locants at the first point of difference. (7) If the ring contains a multiple bond and the side chain contains a functional group , then the ring is treated as the substituent and the compound is named as a derivative of the side chain. (8) If the ring as well as the side chain contains functional group , the compound is named as a derivative of the side chain or the alicyclic ring according as the side chain or the ring contains the principal functional group. (9) If the alicyclic ring and the side chain contain the same functional group, the compound is named as a derivative of the side chain of the ring according as the side chain or the ring contains higher number of carbon atoms. 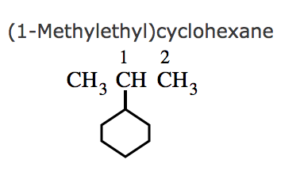 (10) If a compound contains an alicyclic ring directly linked to the benzene ring, it is named as a derivative of benzene. (11) If some functional group along with other substituent group are present in the ring , it is indicated by some appropriate prefix or suffix and its position is indicated by numbering the carbon atoms of the ring in such a way that the functional group gets the lowest locant. 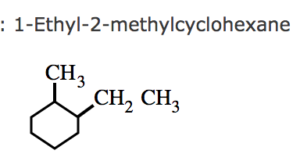 (12) If an alicyclic ring is directly attached to a carbon containing functional group , the carbon atom of the functional group is not included in the parent name of the alicyclic system. Number the carbon chain from either direction. Identify the primary suffix , i.e. ane, ene or yne from the name of the compound. If the compound contains a double bond or a triple bond , identify its position from the name of the organic compound and put the double or the triple bond at its right position along the carbon chain. Identify the name and position of the functional group from the IUPAC name of the compound and fix it at its right position on the carbon chain. 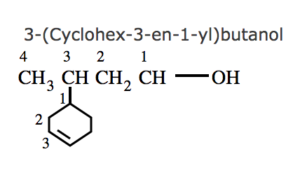 Identify the names and position of the other substituent , if any , from the IUPAC name of the compound and fix them at their right positions along the carbon chain. Wherever necessary , attach the required number of hydrogen atoms to satisfy the tetracovalency of each carbon.